We are excited to be one of the featured homes on this years RDA Tour, titled Additionally. The tour’s focus is on homes with substantial additions, designed by local designers. Our project at 707 Sabine Street in the Old Sixth Ward is a prime Folk Victorian that had undergone one addition previously. Our challenge was to add a substantial amount of square footage, while preserving the small scale of the brick-paved streetscape. 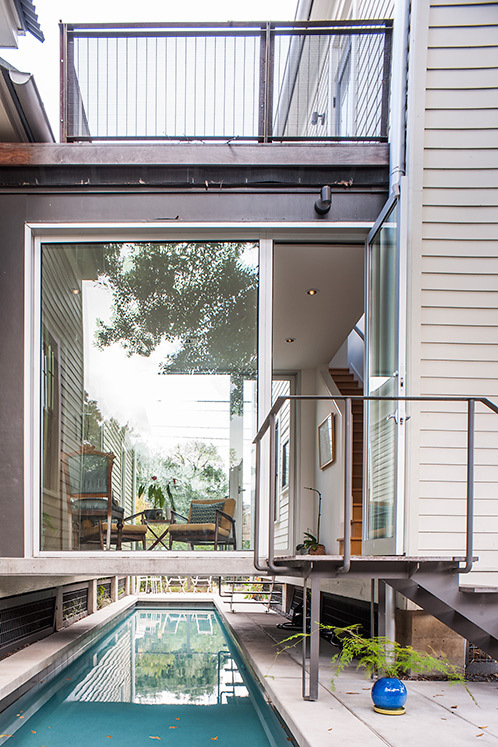 The “bridge” between old and new is a concrete and glass link that spans above the lap pool. Please join us for this unique tour, with some very exciting projects. Tour is Saturday, March 29 and Sunday, March 30 from 1-6pm. Find more information here.